Marie has been an advocate of alternative therapies since 1975. A fundus of the eye characterized by macular degeneration. Disclaimer: This hub article is not intended to treat or guarantee cure of any disease or ailment. The following is presented for informational and educational purposes only. If you have a disease or physical condition of any kind that requires medical attention, please consult your physician or trusted healthcare provider. Having presented this disclaimer, I have decided to take the time from my other daily priorities to share the following information because of the importance of vision. I, myself, have a myriad of vision problems and am of the alternative medicine persuasion. Many years ago, I had considered becoming a naturopath (N.D.). Financial uncertainties kept me from pursuing this life's path. I probably would agree to acupuncture only as a last resort because the insertion of needles into the body is invasive, a type of surgery. However, I must confess to my self-doubt and inconsistency in applying principles of diet and exercise. Meditation and positive thinking, together with these principles, do much to avoid diseases. The information that follows is valuable. Understanding a condition helps free the fear from that condition. Also, I can attest from personal experience that the energy meridians surrounding the physical body are very real, just as the magnetic lines around the Earth with its north and south poles are real. Peace and health be with you! In Chinese medicine, it is the stimulation of chi (life energy) through the use of special needles in attempt to open blockages of certain meridians so healing energy can flow into and through the affected area or organ. 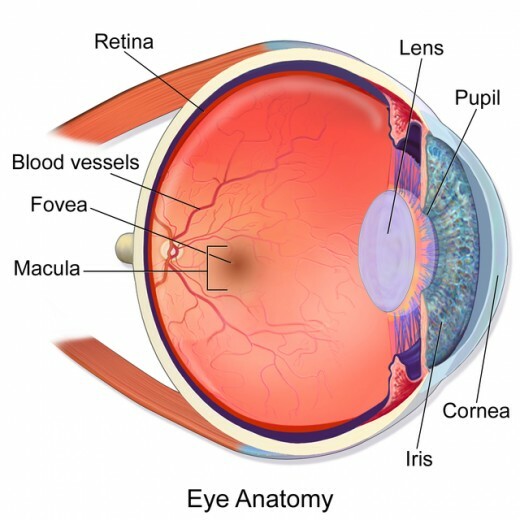 Macular degeneration is when the retina of the eye begins to weaken. The central visual field of the eye becomes compromised. The condition can lead to retinal detachment and eventual blindness. What are some of the symptoms of macular degeneration? There is no specific answer to this question. Each person has to be treated as an individual, and factors, such as internal health, stress factors, body type, and medication use, need to be considered. The eye's health may also be affected by a supplemented diet. 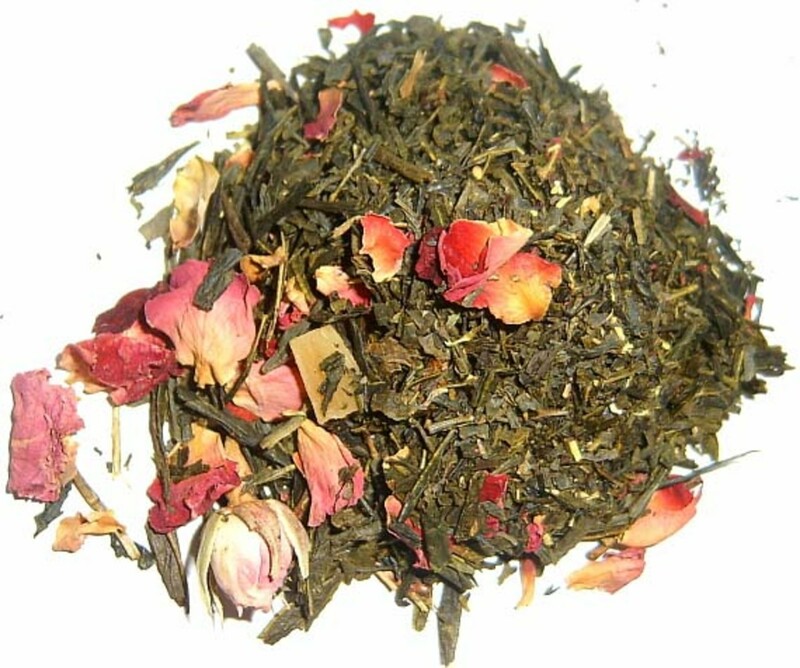 Generally, blood flow and energy to the eye need to be stimulated and re-established. Many times, the optometrist or ophthalmologist will advise the subject that the condition is "incurable" and, at best, recommend the patient take some nutritional supplements to hopefully slow the degeneration. Alternative health practitioners, however, offer therapeutic fasting, dietary changes, acupuncture, and other natural therapies to revitalize the eyes. Acupuncture, according to Dr. Rosenfarb, has had a measurable, positive effect on increasing blood flow to the eyes and visual cortex of the brain. In spectral analysis, these areas appear to "light up" when acupuncture treatment is applied. A majority (> 79%) of patients suffering from macular degeneration have improved their visual acuity (ability to read at least two lines smaller on the eye chart) after receiving acupuncture treatment. Also, ophthalmologists are able to confirm improvement of the retina upon examination. Dr. Rosenfarb has discovered that the most effective acupuncture is when followed by a period of rest, giving time for the eyes to regenerate on their own. Treatment is then repeated to encourage further regeneration. Generally, visual improvement seems to reach its apex in one year. 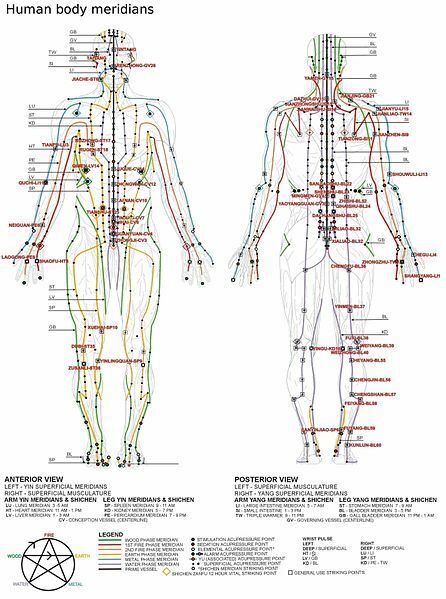 This chart shows the many points that may be used in Chinese acupuncture. 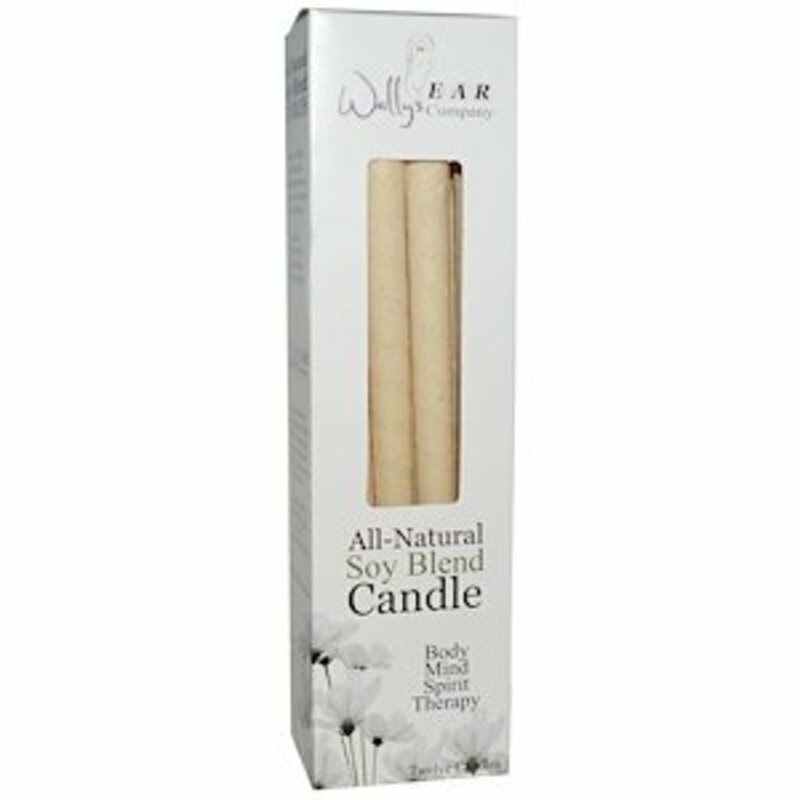 Primarily those in the hands and arm or feet and leg are used initially.. When can acupuncture results be expected? Generally, some improvement can be noticed after two or three days of treatment. However, Dr. Rosenfarb's intensive treatment is acupuncture daily for 5-10 days. The majority of eye patients display improvement in vision after five days of treatment. Serious nerve damage in advanced stages of this disease may take 18 months or longer to regenerate. How long does vision improvement last with acupuncture? The longevity of treatment effects can depend on the stage of macular degeneration. Early stages, for example, only require treatments of once or twice annually. More advanced stages of macular degeneration may initially need to receive treatment four times (4X) annually. The average patient receives maintenance treatments twice a year. Are all patients successful with acupuncture? No, not all, but up to 90% of Dr. Rosenfarb's patients do experience improvement in their condition and their visual acuity. The doctor even has one female patient who is 95 years of age that has been able to maintain her eye health through his regular, periodic treatments. In reality, success cannot be determined by mere examination of the eye. Once actual acupuncture treatments have begun, measurements can be made to determine whether the eyes are responding. Does it matter if my regular eye doctor doesn't recognize acupuncture as an acceptable treatment? In the most dire circumstances, no, because Dr. Rosenfarb will work with any patient who wishes to try acupuncture. However, support can speed the efficiency of test results when determining what extent of regeneration has occurred. A good doctor of any healthcare field is one that functions as the patient's advocate. Can conventional and alternative medicines work together? In most cases, "yes" because then you have treatment coming from various perspectives. These can have a synergistic effect when combined. A patient might take a medication for cholesterol or high blood pressure, for example, while receiving acupuncture. However, there might be some long-term damage from avastin injections because these are chemotherapy; studies still need to be done to verify a conclusion. Definitely steroids and immune suppressants are contraindicated and may even contribute to macular degeneration. What other things can a patient undergo besides acupuncture? Can acupuncture help when macular degeneration onsets at birth? Juvenile macular dystrophy, or Stargardt's disease, is an autoimmune, neurological problem passed to the child through the genes and is present at birth. For these types of patients, Dr. Rosenfarb has successfully used acupressure, micro-current, and low-level (acupuncture) laser that doesn't penetrate the skin. Is there a plateau in Stargardt's where acupuncture is no longer effective? There are two schools of philosophy. The first operates on the presumption that, yes, you've been doing acupuncture and herbs, but you've reached a level of health that seems to be static, with no further signs of improvement. Then treatment becomes a maintenance for that level of achievement. The other approach is one of modifying the treatment, such as adding the laser acupuncture, which may take the improvement signs yet to a higher level. Both methods are valid. The choice becomes a preference influenced by the practitioner-patient relationship. Do black spots, or floaters, lessen with treatment of macular degeneration? Floaters are very common and are not a sign of macular degeneration. The phenomenon is caused by phagocytes when they inefficiently break down waste matter in the vitreous humor. The condition is know as phagocytosis. Generally, when a healing of macular degeneration occurs, phagocytosis also becomes corrected because the overall metabolic process of the eye is improved. What are the differences between wet and dry macular degeneration? Both types respond well to acupuncture, but are treated differently. 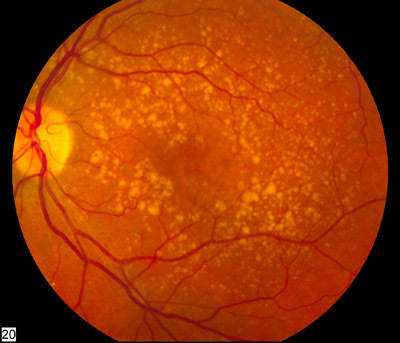 First, wet macular degeneration happens when the macula fills up with drusen, yellow spots that are cholesterol. These block the circulation to the macula and, over time, the macula will degenerate and lose its function. Each cell of the body needs oxygen, food, and a detoxification pathway. To maintain the macula, the body attempts to grow new blood vessels; this is known as neovascularization. Unfortunately, these new vessels are very weak and susceptible to breakage. When these rupture, this is the primary condition of wet macular degeneration and shows as bleeding in the eye. This can be either a short- or long-term condition. Dry macular degeneration also has the presence of drusen, causing the macula to be sick, but with no bleeding. An analogy is like never taking the garbage out of your house, but just letting it build up until room and clean air are compromised. This what is happening to the macula of the eye in the degeneration process. Ophthalmologists and retina specialists agree that the potential for vision loss is greater with wet macular degeneration. Bleeding in the eye causes immediate threat to vision impairment, so either avastin injections to break down the blood waste and/or laser cauterization to stop the bleeding are done. Acupuncture happens to work equally well for both types of macular pathology. For practitioners: What acupuncture points are recommended for wet macular degeneration? There are a couple of scenarios. First, it is important to understand the pattern of the wet macular degeneration. There may either be a yang-rising liver, characterized by inflammation and increased pressure around the eyes. This might be caused by alcohol, stress, poor diet, excessive sun exposure, medication, or a history of stroke or hypertension. The pressure on the choroid, the blood vessels in the eye, becomes too great, causing the vessels to break. The other scenario is based on nutritional deficiency wherein the vessels are weak. 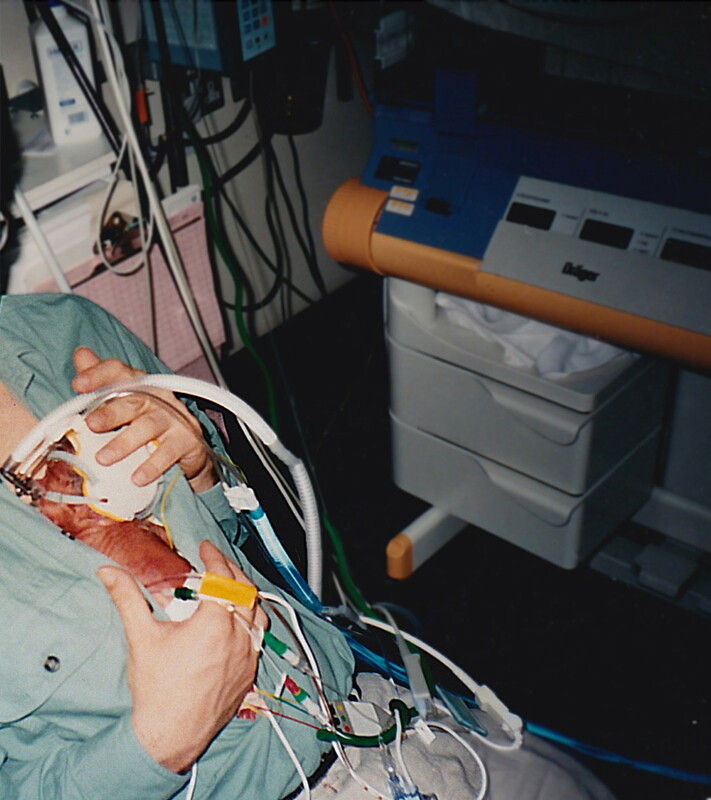 A spleen and heart are the primary organs affected in this case. Choose your patterns and points to treat the underlying cause. After that, you're going to do the branch treatment on the points to increase the blood flow to the retina and back of the eye. Are there any contraindications for electrical stimulation in the treatment of wet macular degeneration? Sometimes great benefits can be achieved, but be careful--you are increasing the blood circulation to the eye and, thus, increasing the risk for vessels breaking. With a personal interest in eye health, I have essentially transcribed Andy Rosenfarb's webinar on macular degeneration and modified some words with my own vocabulary without changing meaning. The questions and answers provided are directly from the webinar, the links to which are provided above the survey. Many people will scoff at acupuncture treatment; others will swear by it. The choice is yours; however, if you are suffering from macular degeneration and fearing blindness, acupuncture may be an option. Thank you for taking the time to read this article, and I hope the information I have shared brings you some encouragement. Currently, I am not associated with the Eyesight Club, but I continue taking a variety of supplements and garden outdoors. I seem to need the sunlight. Thank you for the tip, Perspycacious! Goji berries, especially a variety my wife and I grow, are an effective herbal source of substances which figh macular degeneration. Do the research and enjoy the results. Good discussion here. Any time, Dora. I'll probably be writing more hubs about eye care because I have poor vision myself. If acupuncture is not available, at least try acupressure. The results will probably take longer, but it's the next thing next to acupuncture, only without the needles. Along with eye supplements, mild exercise to increase metabolism and organically grown green vegetables and some fruits in the diet would help. Raw juices from these. My mother has this condition and has been told that there's no cure. The doctor advised that she is too old (84) to try anything. I don't know that acupuncture is available where we are, but I am still grateful for the information. Thanks for sharing these details. The Link Topics feature is great! RTalloni, thank you for reading and commenting. It took me awhile to put this one together because I didn't know what I wanted to do for pictures. I received the invitation to this webinar through the Eyesight Club, a website sponsored by the Cambridge Institute for Better Vision. Personally, I am taking the Eyemax supplemnents recommended by the Institute. An interesting look at this disorder that an aging society should keep in mind. Thanks for putting this info together in a hub for us. Marie, thank you for this very interesting article. Unfortunately, most insurance policies don't recognize the value of alternative medicines, including acupuncture, and therefore don't pay for them. A person has to be able to afford the treatments on his own. I've know a couple of people who have had successful acupuncture for pain, but then had to discontinue the treatments because of cost.